Most paper crafters love to make "samplers" that feature a certain season of theme! 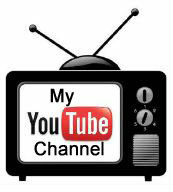 I love to make them too! Today I am sharing an 8 X 8 framed sampler that I created for my Holiday Retreat held in October. We spent the day crafting all sorts of gifts for giving over the Holidays! It was great to get a head start on holiday crafting and my customers went home with over 10 different projects - all complete and ready to give to their friends and family! 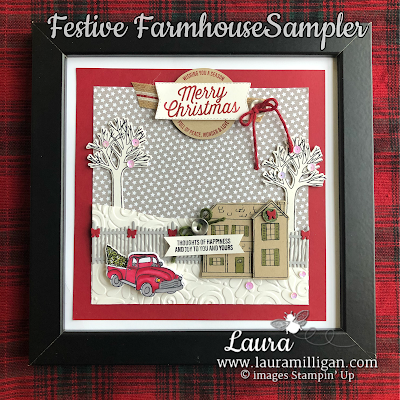 The star Designer Paper is also from the Festive Farmhouse suite, as are the Galvanized Buttons and the striped burlap ribbon and twine. For the snowy landscape, I used shimmery white cardstock and embossed with the Swirls and Curls Embossing folder. I love how the sequins add some sparkle to the trees and snow! They are from the Iridescent Sequin assortment in our Annual Catalog. 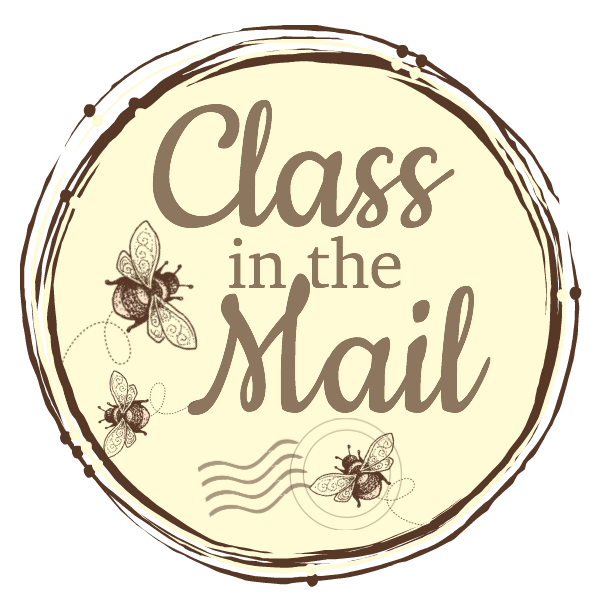 I colored the images with Stampin' Blends - cherry cobbler, old olive, smoky slate and daffodil delight. Quick tip for adhering the fence to the sampler - I like to place a small amount of Multipurpose Liquid Glue on my Silicone Craft mat - then you a sponge to pick up the glue - Sponge lightly on the back of the fence - and attach! So easy! When the glue is completely dry on the Silicone Mat, it just wipes right off! 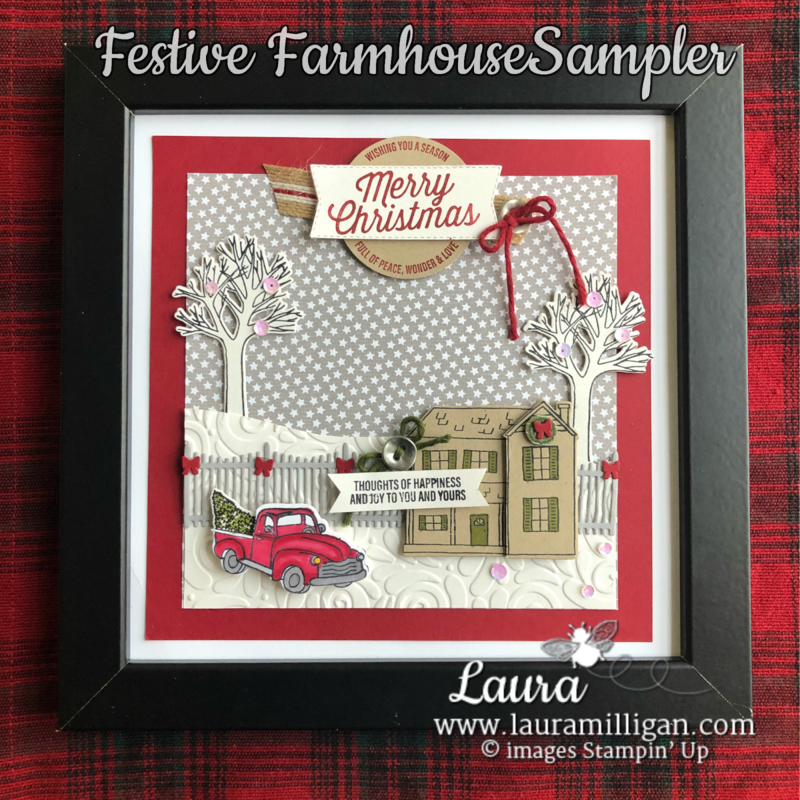 Want to make a Farmhouse sampler of your own? I have listed all the products I used below with Clickable Links to my Online Store - just click on any of the links and you can purchases these supplies!